A Ruston High School graduate is the U.S. Air Force’s newest two-star general. Club on Barksdale Air Force Base in Shreveport on Friday. Marine Corps Gen. James Cartwright, commander of the U.S. Strategic Command and Ramsaur’s boss, presided over the meeting. Ramsaur said he was “very honored, blessed and humbled” by the promotion. He ran through a laundry list of people who helped him reach his position as an Air Force major general. As he ran down the list, Ramsaur ran the gamut of emotions from laughter to near tears. He especially became emotional when speaking about his family. Cartwright then called for attention, and the orders officially promoting Ramsaur were read. What followed next was an old military tradition: Ramsaur’s wife, Sylvia, and Cartwright pinned the new major general’s second star to the epaulets on his jacket. His daughters followed by placing Ramsaur’s new rank on the epaulets of his shirt. Lastly, his grandson, Tristan, presented him with a new garrison hat with his new rank. Jack’s brother James, the director of the Lincoln Parish Park, said he was honored to have Jack for a brother. James said his brother was a good example for him growing up. “I’m proud of his accomplishments and his service to our country,” James Ramsaur said. Ramsaur began his Air Force career in 1974 after receiving his commission through the Air Force Reserve Officer Training Corps. His first operational assignment was as a KC-135 pilot and simulator instructor for the 71st Air Refueling Squadron at Barksdale. His next assignment was as a pilot and evaluator with the 78th Air Refueling Squadron. Subsequent positions included instructor pilot with the 76th Air Refueling Squadron, McGuire AFB, squadron commander of the 970th Associate Airborne Control Squadron, Tinker AFB, and assignments at the Pentagon, Randolph AFB and Seymour Johnson AFB. Ramsaur is a command pilot with more than 5,300 hours in the B-707, B-727, E-3, C-18, DC-10, KC-10, KC-135A/R, T-37, T-38 and T-1 aircraft. 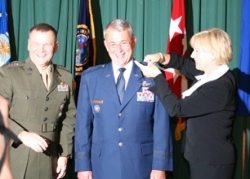 His major awards include the Defense Superior Service Medal, the Legion of Merit, the Meritorious Service Medal with two oak leaf clusters, the Aerial Achievement Medal, the Air Force Commendation Medal and the Air Force Achievement Medal with one oak leaf cluster.